The Central Coast Community has rallied together to create a Central Coast first - a community built replica of one of the cars from the movie Mad Max - Big Bopper. 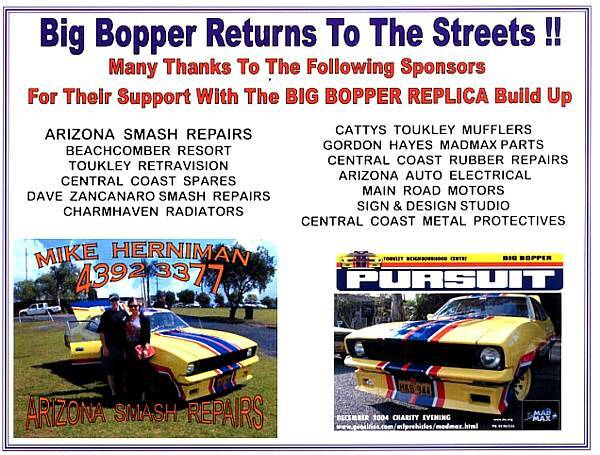 In the movie Big Bopper was one of the Pursuit Cars which were driven by Charlie and Roop. 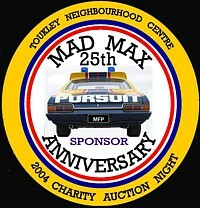 Hugh Keyes Burne, who played the Toecutter in the movie, is one of the main supporters of the fundraising events. Interestingly, the base car, a 1975 Ford Falcon sedan which was purchased some months ago bears his intials on the numberplate (HKB). Another co-incidence is that after much searching the car was available for sale in the street behind the Neighbourhood Centre.